May was National Cystic Fibrosis Awareness Month. Across the country, thousands of volunteers came together to raise awareness about this devastating disease and share their story of hope and progress. People with CF are not encouraged to socialise with each other. The risk of cross-infection and exacerbation of lung conditions is too great. CF can be a lonely existence. For the month of May, a number of local Sanitair technicians donated a percentage of every Premium Split System Service they carried out. The funds go toward Cystic Fibrosis Australia’s 65 Roses national fundraising campaign to be used as research for a cure. 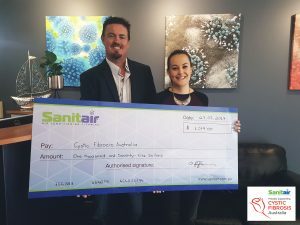 Sanitair Australia CEO, Craig Jefferies presents Justine Foulkes on behalf of Cystic Fibrosis Australia with a cheque for $1079.00. On Friday 17th March 2017 at 3pm – We’re helping to beat blood cancer by taking part in the Leukaemia Foundation’s World’s Greatest Shave! 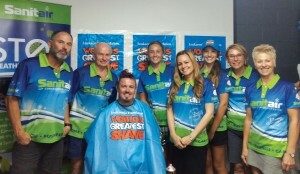 Please sponsor us to give Aussie families facing blood cancer the emotional and practical support they need. You will also help fund vital research so more people survive blood cancers like lymphoma, leukaemia and myeloma. You may not know it but blood cancer is the third most common cause of cancer death in Australia, claiming more lives than breast cancer or melanoma. And every day another 35 people will be diagnosed. Soldier On is about Australians coming together to show their support for our physically and psychologically wounded. We want to show the men and women of our Defence forces that we will always have their backs.Founded in 2012, the organisation was inspired by the death of a friend. Lieutenant Michael Fussell was killed in an IED blast in Afghanistan in 2008 and his friend John Bale looked for a way to support those who survived the blast.He quickly realised there was no easy or accessible way for members of the Defence forces, or the public, to show their support for those wounded in battle. With his wife Danielle, they reached out to his fellow soldiers and enlisted the help of Cavin Wilson, who had been posted in Afghanistan, involved in returning soldiers killed or wounded in action. Together they decided it was time to start an organisation that connected these men and women to the wider public, ensuring these brave sailors, soldiers, airmen and airwomen could be cared for and lead fulfilling and successful lives. Shake it Up Australia Foundation is a not-for-profit organisation established in 2011 to promote and fund Parkinson’s research in Australia. The foundation was established by Clyde Campbell, a father of three and business owner who was diagnosed with Parkinson’s disease in 2009 at the age of 44. Personal experiences with this insidious disease has highlighted the need to help fund research by Sanitair’s Director and CEO into finding a cure.